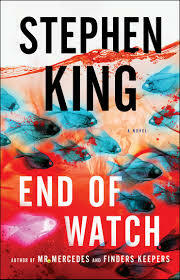 This week I was up late with Stephen King’s End of Watch, the third book in the Bill Hodges series. I’ve been eagerly awaiting this book since there were hints about the topic in the last book, Finders Keepers. Bill Hodges returns with his partner in solving crimes, Holly Gibney. We even have a chance to see Jerome Robinson and his sister Barbara. This book focuses on Brady Hartsfield, the Mercedes Killer from book 1, Mr. Mercedes. Although everyone thinks he’s a vegetable, he’s actually back, and his doctor has been using experimental drugs, which may or may not have enhanced some of his abilities. Now, Hodges has to contend with a psychotic who has special powers–and on top of that, Hodges is having some health problems. At the end of the book, King writes: “End of Watch is fiction, but the high rate of suicides…is all too real. The National Suicide Prevention Hotline number given in this book is also real. It’s 1-800-273-TALK. If you are feeling poopy (as Holly Gibney would say) give them a call. Because things can get better, and if you give them a chance, they usually do.” This is why King is a favorite writer. He uses his powerful influence for good. How can you not like this guy? If you’d like to win a gently used copy of this book, either comment below, or retweet or like our original twitter post by Saturday, June 2. Congratulations to the Owl Who Reads who won a copy! 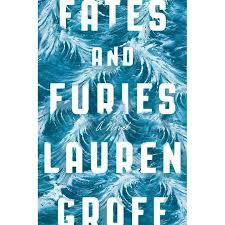 I’ve been intending to read Fates and Furies since it was a National Book Award Finalist, and when the universe put a copy in front of me, I snatched it up. This was one of those epic stories you read over a weekend and then walk away reeling from the story, thinking about it for days. This tells the tale of Lotto and Mathilde, who meet in college, marry, and live a life destined for greatness. Although Lotto comes from money, his mother disowns him, and he must make his fortune on his own–which he does by writing plays. When the narrative shifts halfway through from Lotto to Mathilde, it shifts the way we make meaning of this story. I was pleased we were able to hear Mathilde’s side to the story, which shed light on a number of elements in the story I wondered about. Lotto looked at his wife, touched her cheek, “Yes,” he said. We Need Diverse Books @diversebooks has a mission of putting more diverse characters into the hands of children. They do a great job curating and retweeting relevant articles. Maria Popova’s @brainpickings offers links to short articles where she sifts through philosophy, literature, and all manner of texts that she distills into brilliant posts that make you think. Open Culture @openculture also offers links to different media with lists, stories, audio, and video. The Writer’s Almanac @writersalmanac posts daily poetry, prose, and literary history. Bibliophilia @Libroantiguo posts historic images and information about books and authors. This novel pulls you in to the story of Elizabeth Endicott via her granddaughter Laura’s voice. She tells us her grandmother’s story — how she went to Aleppo with her father to help and how she fell in love with Armen, an Armenian engineer. Some of the reading is downright grisly and graphic, and Bohjalian does not avoid showing just how horrific the genocide was for men, women, and children. However, I think he balances the violence with other scenes so it is not overwhelming for the reader. 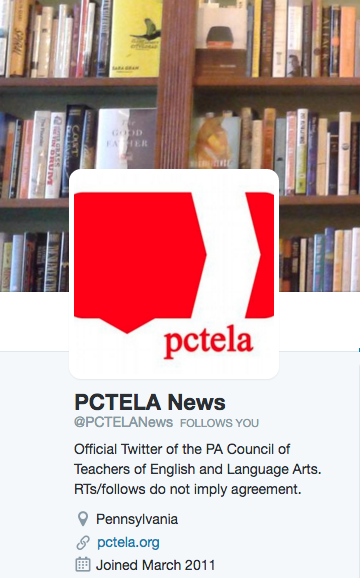 Last month, we were happy to kickstart our PCTELA Advocacy Spotlight Series, which will provide our membership with monthly articles featuring trending issues related to teacher advocacy. In May, our focus was on the newly reauthorized Every Student Succeeds Act and its implications for the 2016-2017 school year. For the month of June, our focus will be on another one of the Obama Administration’s plans to reform education from the national level. This month’s advocacy spotlight is on the ConnectED Initiative. In June 2013, President Obama announced the ConnectED Initiative; a five-year plan to provide 99% of American students with the broadband and wireless connection necessary to enrich their academic experiences and equip them with the technological proficiency necessary to succeed in the digital age. This initiative promises to provide teachers with the training and professional development they need to incorporate new technology and rich digital content into classroom instruction. With ConnectED, the Obama Administration extended the opportunity for school districts to become advocates for students and communities who suffer from a lack of technological resources. To see the video of President Obama’s announcement of the ConnectED Initiative and remarks on the importance of technology in American schools, click here. Obama called on both the private sector and the FCC to address this technological deficit by reallocating funding and support to provide the much needed high-speed internet availability to communities across America. The FCC Commissioner supported the ConnectED Initiative completely, leading the FCC to reform its E-rate program in 2014. A new modernization order was authorized, allowing for an increase in funding and maximizing options for academic entities seeking to secure high-speed broadband, regardless of location or socioeconomic status. In the last few years, federal government investments into this initiative have led to massive upgrades in network infrastructure, and the Obama Administration has broken ground in its commitments to preparing teachers, students, and families for success with these technological advancements. The Obama Administration is leading a three-pronged effort in closing the digital divide in our country: to provide internet access to as many households as possible, to improve technological support in schools and libraries, and to prepare teachers to incorporate technology effectively in the classroom. Students who do not have internet access at home are reported to perform worse on standardized tests and to have more difficulty finding jobs than their peers. 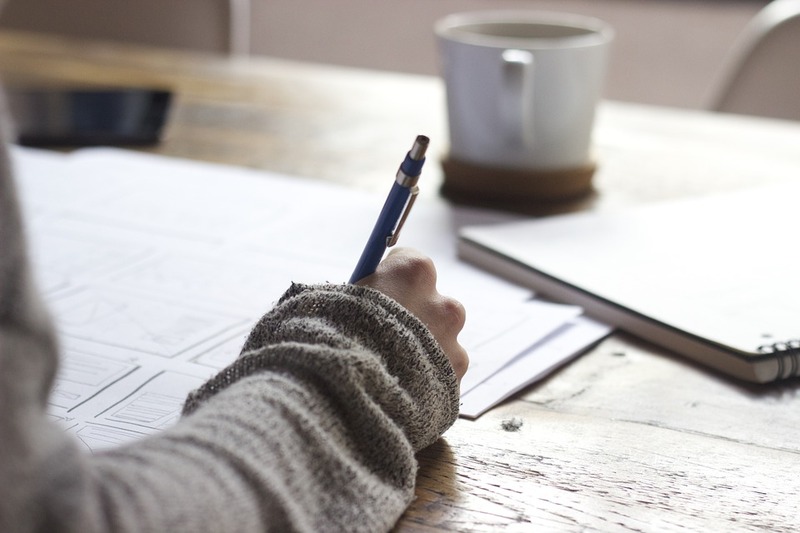 In an effort to give students home access to internet assignments and online classes, and to provide more opportunities for independent research, the Obama Administration announced the ConnectHome plan. This plan will attempt to provide high-speed broadband to families across the country, and its pilot program will reach 275,000 low-income households and about 200,000 children. ConnectED’s public and private commitments have to date provided about 3 million students across all 50 states with new educational tools produced by high-speed internet connections in schools. Over 30 major cities and counties have announced that they will participate in the Library Challenge, a plan Obama announced last April. This plan encourages libraries to work together with local officials and school leaders in order to provide all students with a library card and access to programming that supports their technological learning needs. The Enhancing Education Through Technology Program enables more school districts to provide professional development as teachers transition to enhanced access to technology in the classroom. The U.S. Department of Education has released guidelines on how school administration can leverage existing federal funds to support teacher training and curriculum development during this time. ConnectED sponsors interactive demonstrations for teachers who opt to participate in professional collaboration, and it allows teachers to engage in meaningful conversation with other educators worldwide. ConnectED also fosters relationships with multiple private sectors to strengthen the presence of digital resources in the classroom. How can you and your school district get involved? The Future Ready pledge was created to provide accountability for superintendents who commit to foster a culture of digital learning in their district. By signing the pledge, superintendents are publicly demonstrating their intent to collaborate with district stakeholders, empower teachers, and mentor superintendents from other districts in their transition to digital learning. This summer, there will be a number of Future Ready Summits held around the country for district teams to brainstorm and plan out their visions for digital learning in their schools this year. There will be workshops, discussions, and exemplars led by experts to foster conversation about technological growth in each school district. If you are a superintendent, you can sign the pledge today! If you are not a superintendent, you can encourage your school administration to become involved. The District Assessment is a free planning tool that can provide valuable insight and opportunities for your district on how to integrate technology into effective instruction. You can also create a team and register for free to attend any of the summits planned for this summer. And lastly, you can sign up for updates from the White House regarding future progress made by the Obama Administration to connect America. In the digital world we live in, it is up to educators and school administration to advocate for the technological advancements and support needed to create the next generation of technologically responsible, digitally literate, and well-rounded Americans. Usually I just have reading goals, but this summer I’m determined to set and meet writing goals. Since we ask students to write all the time, I think it is important to be writers ourselves. Here’s my list of writing goals for the summer, now go and make yours! 1.Finish up the Instructor Manual for Jim Burke’s new book (yes, I just name dropped, but it’s Jim Burke! And he’s the nicest guy.). Uncharted Territory: A High School Reader has been a phenomenal project to have been involved with even at the minimal level. It comes out 8/15, and the Instructor Manual should be out in December. I just have three more chapters to go! 2. Work on my own book. I often wonder why kind of information would I have appreciated in book form when I was a new teacher. I also wonder if any of that matches up with what I’m looking for now, as a mid-career teacher. I have an idea about a book that looks at frameworks for teaching, and I’d like to get a draft of that together this summer. And if it never goes anywhere other than my computer, it will be an exercise in pulling together my thoughts at my career’s midpoint. 3. Write short stories. I have so many ideas floating around. I’d ideally like to finish drafting and revising a half dozen short stories this summer. We’ll see how that goes, but I do have two people who have agreed to exchange writing with me, so that will be helpful! 4. Write poetry. Two summers ago, I made a deal that I would write a poem every day for 30 days. It worked, and that year I submitted a number of poems to the Pennsylvania Poetry Society annual contest (I even placed with 3 poems). I’d like to get back to writing poetry, but I think one a day might be too much. Perhaps if I write 10 new poems by the end of the summer, that is a reachable goal. 5. Freewrite! One thing I would like to return to is freewriting. This is where I come up with ideas and where I can just write whatever I’m thinking. I’d be happy to freewrite for five minutes a day. I read the memoir Fresh off the Boat based on a student recommendation, and I am so glad I did. Essentially, it is a bildungsroman of an American Born Chinese man with a terrific sense of humor and of style. I recently read a tweet citing Eddie Huang as saying he read Junot Diaz, not Anthony Bourdain, and I can see the influence in little ways, like the use of footnotes, but I can also see the similarities of a young man negotiating his identity. 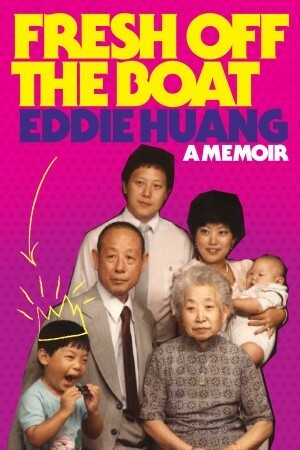 I also just found out Huang has a second book I plan to read this summer: Double Cup Love. In class last week, we talked about how books could be windows or mirrors, and one of my students told me why I should read Fresh off the Boat: “It’s such an important book for every Chinese/Taiwanese American to read, especially if they’ve found themselves stuck between a mirror and window all their lives.” That made a lot of sense after reading this. It tells Eddie’s story of growing up in Orlando, having to deal with racism at a young age, and his anger in reaction to it. I applauded his inability to just let things go and I marvelled at his tenacity to hold on to his ideals in all stages of his life. I also now really want to visit his restaurant, Baohaus, in New York. The show based on this book is apparently not nearly as raw as the book itself, and Huang has argued the ABC sitcom has been sanitized, which, to be fair, makes sense for ABC because the book is riddled with the f-bomb as well as drugs and some fairly violent scenes. I’m not saying it should have been sanitized, but I was trying to think if it would be OK for me to recommend this book to students with all the violence, drugs, and swearing in it. I’ve come to believe it would be a good choice read, but would probably not fly as a full class read, which is unfortunate.